After waking in the midst of a high school party turned blood bath, Tana discovers that she is only 1 of 3 who survived. Fleeing for their safety Tana, her newly infected ex-boyfriend Aidan, & a mysteriously handsome Vampire named Gavriel decide to head towards a nearby "coldtown" (a walled city built to quarantine vampires & those who chose to mingle with them). Along the way, the trio picks up a set of twins who are also headed towards the city. Midnight & her brother Winter are familiar with the coldtown through message boards, Midnight's blog, & from watching various feeds that stream from the town. Tana & the others think that this knowledge could benefit them all once they've reached their destination. However, once they arrive, very little actually goes as planned. Coldtown is not exactly as the feeds make it appear to be & the vampires are not the only ones willing to do anything to get what they want. 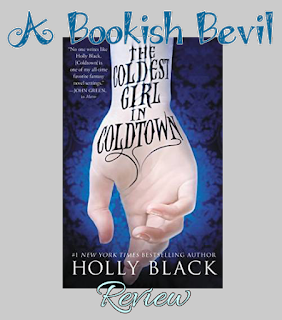 Will Tana be able to make it out alive or will she go cold while trying to survive in this coldtown? This story was a perfect read for the beginning of October. Not to mention, Hello.... VAMPIRES! It's been quite a while since I last read a book that contained these blood sucking creatures. And let me tell you. I was not let down by this one! It was both familiar & unique. The characters are each different but written to where they feel slightly familiar at the same time. One minute I wanted to be a vampire. The next moment, I wanted to stake one in the heart. I have never read anything else quite like this before. It was the whole "Coldtown" concept that caught my attention & made me add this book to my "to-read" list. Just the thought alone of being trapped in such a place gives me shivers. Going through Tana's experience with her added a whole new level of suspense. Numerous times I was hanging on the edge of my seat wanting to know what was going to happen next. This is my first Holly Black read. (hangs head in shame) I can promise though, that it will not be the last. Her style of writing throughout this book was, like the book itself, unique. Each character had their own personality & it was emphasized through the author's writing. It put a fresh spin on things. Definitely kept it interesting. Not to mention- I had no trouble visualizing things as they occurred.